As sweet as cinnamon: Studio Rooms to Dream About! 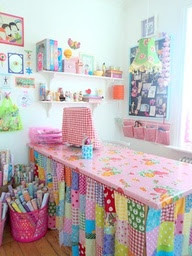 I want to brighten my sewing room. I made a new table top the other day and need some more inspiration. You'll surely be inspired like I have been. 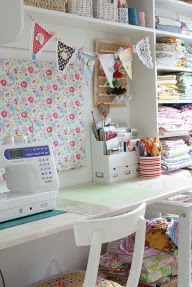 Wouldn't it be lovely to have one of those sewing rooms! They are all so pretty...& feminine. Que preciosidad de trabajos,me han gustado mucho. Some truly lovely rooms on show. Pinterest has some really lovely stuff on show. Dream Timemmmmmmmm! 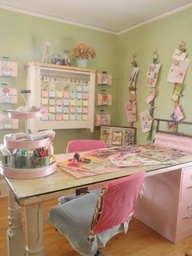 Isn't Pinterest full of inspiration? 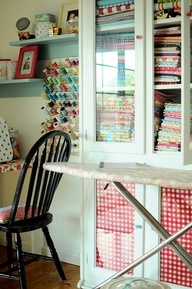 I get so distracted looking at all of the beautiful rooms and quilts that, before I know it, a whole hour has passed! Whoops!